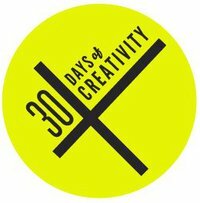 Last year at this time, I enumerated the creative efforts I made during 30 Days of Creativity (what’s that?). There won’t be a post like that this year, even though I did work on creative projects—well, one creative project—every day. Instead I’m just going to write a bit about that one project. Yeah, fine, I’m writing a novel. And right now, I’m loving it. It’s possible to feel quite self-conscious about working on a novel—and this (hilarious) Twitter account certainly rubs it in—because actually finishing the novel in question and getting accepted by a publisher is nothing but a pipe dream for most would-be novelists. In this day of facilitated self-publishing, though, they may not be unattainable dreams (though doing it all yourself is difficult, and may not be worth it—don’t get me started). The point is that I took a stab, this month, at working on the novel I’ve been working on, off and on, since I was seventeen. That’s a decade (I was a little surprised to realize). Why did I take this stab at this time? Partially because I wanted to participate in #30D0C, partially because I have some pipe dreams, partially because I want to make myself finish this blasted thing, but mostly because I acquired an important writing tool: a buddy. I talk to other people about writing sometimes, but I’ve yet to find a really good writing partner. There’s a degree of trust that needs to be there, and a similar work technique. [I have other friends who] are good to talk to about ideas but not so good with motivating me to actually write. They are too lenient with my excuses. [Others are] good for motivation but I don’t think they have the same ideas about style, characterization, etc. as I do, so I can’t see them turning into mutually beneficial critique partnerships. We disagree a lot about human nature. … I think you and I have similar ideas. Which is funny because I don’t think we have similar reading tastes. WB:The first rule of writing is to read a lot in your chosen genre! Me: Yes. Although I also feel that reading widely, anything that you want, will help your writing. But yes, definitely if you are aiming for a specific genre, read it. WB: Reading widely helps, yes. … I have a friend who likes action/adventure whereas I tend to like books about feeeeelings (I love ones that combine the two, but they’re more rare). Me: Again I concur with you! My creative-writing prof used to joke—but it’s true—that writers prefer to have written than to write. Having someone encourage you, though, can do wonders! (This is also true of such things as dieting and exercise, and all self-improvement projects.) I’m so glad that our ability to encourage one another in this way has developed, or emerged. She was there all along! Heck, we have been good friends since I was seventeen, which is the year I began writing this thing. Writing Buddy: Yeah. My evenings are just really short as it is. And I don’t feel like spending them working … which is no excuse, because once I get started it never feels that much like work. I find I blog more when I’m trying to write. I’ve heard people say that they feel blogging, etc. takes up energy that could be better used writing their next book, but I feel like it’s all exercise. And blogging helps me remember that i like writing. In addition to sharing small scenes from each of our projects with one another for feedback, we’ve had discussions about writing outlines, introspection vs. action, conflict (here is a funny conflict-generator tool I found), character development and motivation, plot development, writing style (tense, etc), details related to setting. Also we’ve been making up some fake band names, which has been a good time! Who owns … experiences is strange to think of, but I do think we have a right to fictionalize our lives if we want to. After all, it doesn’t expose anyone as much as it exposes the author. The only thing for me to do now is keep going. And my writing buddy and I have no plans to stop. So, in the end (of this post), my writing advice is: use the buddy system (but be selective about your buddy). Me: That is funny. Maybe I should add an update in which I quote the comment you just made, ha! WB: Haha yeah, feel free. Everyone needs a that guy. Read with keen interest. A post like that can be encouraging in itself. I want a game design buddy! How do I get one? 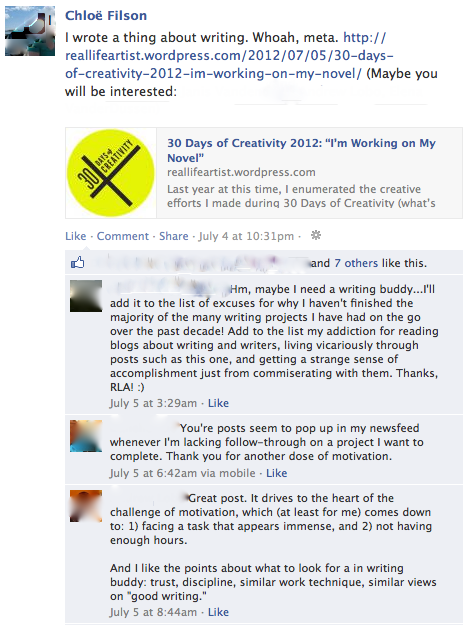 on July 7, 2012 at 02:04 | Reply f.
My friend and I were talking just today about how we both wanted art-making buddies!